Marketcalls held a meetup last year during June 2012 in Chennai. This Year things are taking a fresh look. 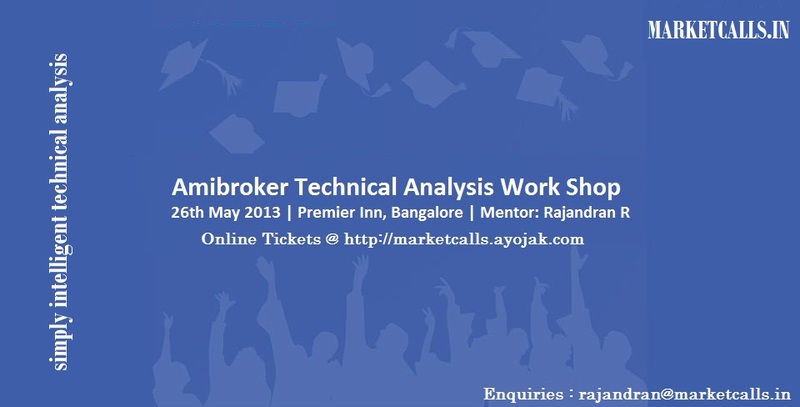 We are proud to host a one day workshop in Bangalore on Technical Analysis using Amibroker Software. It is not the usual seminar to market one’s own product and strategies. It is all about taking that extra step to discover, know and share the trading ideas, challenges and Trading Discipline. Join Us at Premier Inn on May 26th 2013 to qualitatively spend the entire day enhancing your trading skills and exploring the full potential of Amibroker Trading Strategies. Gear up for the thought provoking interactions, basic and advanced trading excercises and powerful Q&A sessions. Of course yes, a delicious lunch is awaiting! Traders, Analysts, Brokers, College Students , Anyone interested in Investing, DayTrading, Technical Analysis, Trading Strategies, Trading Softwares, Trading System Development. Any plans to hold such a seminar in Delhi anytime , that will be easier kindly inform in advance. Yes We plan to conduct one session in a year in major cities. Definitely Delhi is in our sight. Any plan for Mumbai in near future? Hi Rajandran, I would like to attend ur seminar at Delhi if conducted, please inform me too. Try visiting http://batchuforecast.blogspot.com -- for technical views on NIFTY stocks and index. Please, everyone are invited for reviews/opinions on my views. use the coupon code MKTCLS to get 20% discount on the entry ticket. Limited Discount coupons available. I want to join seminar so pls send me more detail abt that. Me from Mumbai pls reply. PLEASE SEND ME THE WORK SHOP DETAILS FOR BNGALORE.